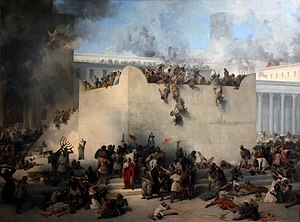 Tisha B’Av (ti-SHA beh-AHV) is a commemoration of disasters that the Jewish people have experienced over the centuries, starting with the destruction of the first Temple (586 BCE) and the destruction of the second Temple (70 CE). But if we recall these two destructions purely as “look what terrible things have happened to us” we have missed the point. The point, as underlined by the readings from the Prophets over the past three weeks, is that the Temples were not destroyed by random chance or the whim of a jealous God. They fell because the Jews of their time lost track of Torah. The rabbis of the Talmud tell us that the first Temple fell because of idolatry, sexual immorality, and bloodshed. They believed the second Temple was destroyed because of sinat chinom, baseless hatred among Jews. Now you may say, “Oh, I don’t think that God causes wars or punishes people by destroying cities,” and I would agree with you. People make wars, and people destroy cities. And it is in the way that we Jews conducted ourselves before the fall of each Temple that the seeds of destruction were sown. The first destruction was in 586 BCE (before the common era, similar to the Christian B.C. ), and the only records we have of it are the records in the books of the Bible. What we know is that for a long time before the destruction, the prophets were warning the people of Judea that the way they were living would end in disaster. They were worshiping foreign gods, distracting themselves with sexual immorality and engaging in bloodshed. The leaders put their faith in foreign alliances, and their economic policies favored the already wealthy over the poor, especially anyone poor who was not likely to ever be rich (widows and orphans.) If you don’t believe me, read the first chapter of the book of Isaiah. History has shown again and again that bad alliances, fraud, economic injustice, and lawlessness are a recipe for disaster. We know more about the second round of destruction, in 70 CE (corresponds to the Christian A.D.). In that time, Jews divided into political and religious parties that hated and scorned one another. They could not work together on anything; they could barely occupy the same country. While they squabbled and called each other names, they started a war with Rome, and Rome destroyed the Temple. If you read the history of the time in the record by Josephus, it’s pretty clear that we brought the rage of the Romans upon ourselves, and we did it mostly by mistreating one another. The rabbis who survived described the attitude of the time as sinat chinom, baseless hatred, and they established a season of mourning to remind their descendants that all these activities (idolatry, immorality, murder, economic injustice, and baseless hatred) had been the road to ruin. So for three weeks every year, we read warnings from the prophets, and we finish by observing Tisha B’Av. 1. Do I engage in acts of sinat chinom? That is, do I take part in conversations that speak hatefully about other people? I can (and often do) disagree with other people, but am I willing to listen to them and to have a civil conversation with them? Or do I let myself off the hook by saying that they won’t be civil to me, so I can be as nasty as my yetzer harah (my evil inclination) wants to be? Today, I will engage in a fast of the heart: What needs to change? How fast can I change it? An earlier version of this blog listed the date of the destruction as “386 BCE.” My thanks to the alert reader who caught my typing error! I try to catch all of those before I publish, but things sometimes slip through. Thank you for telling me!